The average American consumes more than 160 bowls of cereal a year, so picking the right box could mean knocking 15 pounds off your waistline yearly and infusing your diet with massive doses of vital nutrients. The key is to pick the one with the highest ratio of fiber to sugar, along with a respectable calorie count. Sidle up and grab a spoon! My personal favorite is Fiber One Original. Those living outside the states may not have access to this amazing fiber steroid. No worries, just go to your local supermarket and read some labels. 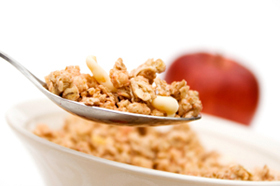 Go for the least amount of sugars with the most amount of fiber. In the stomach, fiber is bulky, so it tends to make us feel full. Don’t worry about it not tasting as pleasing as the one with 20+g of sugar. You can always add some berries, nuts, dried fruit, etc. and make it fun. It’s also very important to choose the right type of milk. While regular milk may taste rich and flavorful it is very high in fat. Try going for a low fat brand or skim. I personally like soy. Its got a good amount of protein and it runs low on fat. Fun fact: On average, it takes 39 hours in women and 31 hours in men for food to pass through the colon and out of the body. This time varies a lot from person to person, depending on personality, state of mind, and fiber intake. Usually, the effect of fiber is to speed up this process.